UNITED NATIONS, New York – The world is home to 1.8 billion people between the ages of 10 and 24. Nearly 90 per cent live in developing countries. Young people worldwide contend with poverty, discrimination, violence, conflict, disaster and displacement. One in five are not in education, training or employment. Many struggle to get what they need to make their way in the world – and to make their voices heard. But the UN Youth Strategy, launched at the 73rd Session of the United Nations General Assembly, aims to bring them to the table. The event opened the General Assembly floor to a range of leaders, activists and artists representing the largest generation of young people the world has ever seen. Speakers included Batool Alwahdani, Vice-President of the International Federation of Medical Students’ Associations; poet Emtithal Mahmoud; YouTuber Lilly Singh; and Kim Nam-joon (better known as RM) of the K-pop band BTS. “Young people are inviting themselves to the table, and making themselves part of the circle,” said UNFPA Executive Director Dr. Natalia Kanem, speaking at a pre-launch panel discussion with Ms. Wickramanayake and other young activists. “This is going to broaden the spectrum for everyone,” she added. In a world still marked by gender inequality, young women and girls bear a disproportionate share of their generation’s burdens. Discrimination, sexual and gender-based violence, and harmful practices like child marriage and female genital mutilation threaten their health, safety and ability to thrive. Many young women and girls are disenfranchised from decisions that affect their bodies and futures. At the pre-launch panel, Dr. Kanem emphasized the need to support the sexual and reproductive health and rights of young people across the globe, and especially girls. “We want them to know that knowing your body is protective,” she said. In adopting the Youth Strategy, the international community pledged to break down the barriers that keep young people from realizing their rights – and to open up decision-making processes to engage them as agents of change. UN and Member State officials outlined commitments to support and work with young people. The agenda included finding solutions to equip all young people with the skills the global economy demands, and to ensure that they can access the livelihood opportunities, care and protection they need to build the future they want. Speaking for UNFPA at the launch, Deputy Executive Director Dereje Wordofa affirmed that young people are at the core of UNFPA’s mandate – and spotlighted the importance of sexual and reproductive health and rights in empowering them to fulfil their potential. “I commit on behalf of UNFPA to join hands with our partners, to be bold and vocal so that every young person can realize their rights, including sexual and reproductive health and rights,” he said. 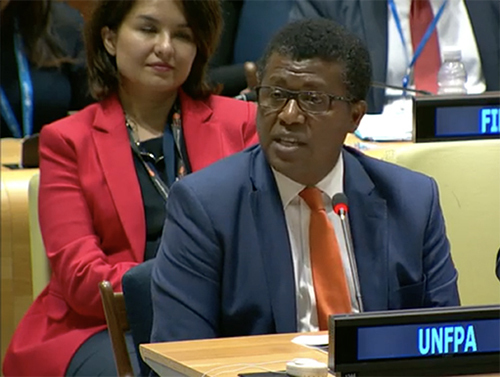 He also pledged to use UNFPA’s strength in population data to target effective investments in young people that accelerate the well-being and prosperity of entire countries, and committed to addressing the needs of young people in humanitarian situations.